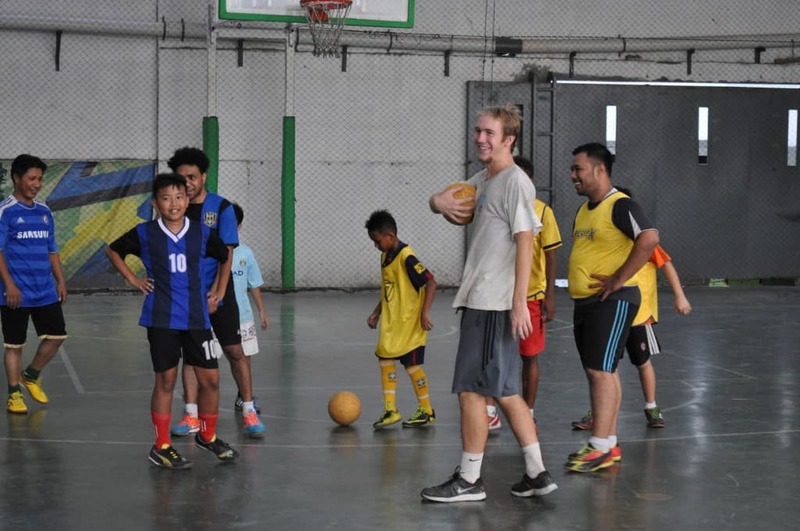 CAC volunteer Charlie Crawford blogs from Jakarta, Indonesia with Uni Papua. September 23rd 2015. After our arrival in Jakarta, Coaches Across Continents had a rare evening of having more people present than our hosts. With 6 CAC coaches in one place (3 full-time and 3 volunteers), we went out for a delicious meal with some of the leaders and coaches of our partner program, Uni Papua. A full stomach and a good night’s sleep later, the CAC Coaches went their separate ways while Turner and I stayed in the big city to spend a week with some of the core Uni Papua coaches. We worked each day in a roofed basketball court of a local primary school where being pointed and stared at became our standard greeting. It was a small group of coaches, but because of that we were able to give more one-on-one attention than we typically can. To get around the city we were introduced to a new friend named Rudolph (as fitting a name for a guide in an unknown country as I’ve ever heard). Among his many gratitude inspiring actions, I don’t think I can thank him enough for introducing me to the Indonesian dessert, martabaks. The closest I can describe a martabak is as an inch thick pancake thickly coated in butter, sugar, crushed peanuts, more butter, chocolate, then folded over and handed to you in a box. I could have sworn I heard a few arteries close as I devoured this food from the gods. Some things should not be allowed to exist in a healthy world. Its times like these I can’t help but appreciate a little indulgence. CAC has put me in two of the most formal settings of my life. One was a meeting in a conference room of one of the Ministers of the Katanga Province in the Democratic Republic of the Congo. The other was a debriefing in Jakarta’s Ministry of Housing. Serious faces on serious people speaking Bahasa (a language I’m practically limited to counting to 6, saying “thank you” and saying “slow down”). In the inevitable bureaucratic fashion, snacks were distributed to ease the delay of the proceedings (a rice-ball filled with something savory wrapped in a banana leaf). Once Harry, the leader of Uni Papua, began to speak, Turner and I could pick out enough words to see that he was introducing the concept of Sport for Social Impact to the group of 50 well-dressed members of the community. 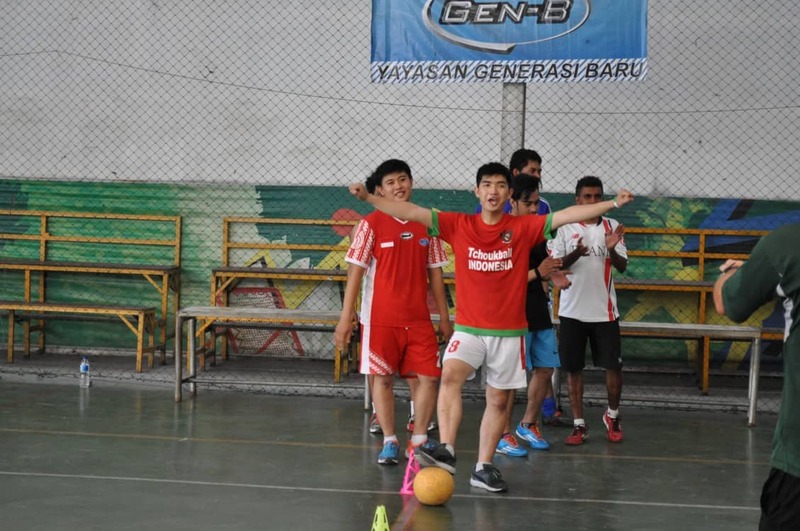 The people in this room had gathered to hear about this new way to coach and how Uni Papua would be using it to host the Jakarta Football Festival – Rusun Cup, a massive youth tournament to take place the following month. An impressive endeavor that gained the much appreciated help of the governor himself. Some would find it uncomfortable given a seat at the front and being occasionally gestured towards in this language we couldn’t understand. Before CAC I would have been one of those. Instead, when it came time for Turner to ask for volunteers to play a couple games as demonstration, I was confident that they would go well. They did. Formality faded in an instant and the top floor of the Ministry of Housing filled with the laughter and problem solving that is so naturally part of Coaches Across Continents. Jakarta and CAC were understanding each other.